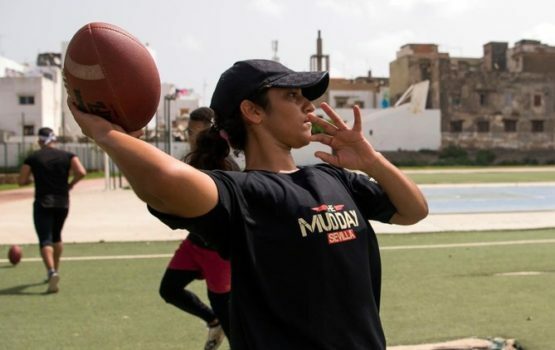 Under the scorching summer sun in Rabat, coach Ichtar Zahraoui bellows directions to “The Pirates”, young Moroccan men and women learning to play American football together on the gridiron. Focused and sweaty, 30 players gather every Sunday to practise the sport, an unusual scene in a country obsessed with soccer, the variety of football far more commonly played across the globe. “It’s not easy to make young Moroccans love American football,” 39-year-old Zahraoui says. “It’s an aggressive sport that requires a lot of energy, work and equipment,” says Zahraoui, who founded “The Pirates” men’s and women’s teams in 2017. Lacking numbers and resources, they have to train together on the same modest plot of land in the heart of Rabat’s Old Town — and if that’s not available, the beach. At practice the “Pirates Boys” and “Pirates Girls” zigzag between cones and plough into tackling dummies, training pads and sometimes each other. Without hesitation, the players — mostly students aged under 30, recruited by word of mouth — form mixed teams and alternate between offence and defence. “We’re trying to make the sport known and to explain to people that football isn’t rugby,” Zahraoui says. The breathless self-taught coach has dreams of setting up the kingdom’s “first real American football team”. To do so, she needs the support of an “American coach and a large NFL club”, she says, referring to the National Football League in the United States with which she has had “interesting contacts”. American football made its debut in Morocco in 2012 with the creation of amateur teams in cities like Casablanca, Rabat and Tangiers. Two years later, the men’s national team won an inaugural African championship. In 2015, Morocco’s first women’s football team — the “Black Mambas” — was formed in Rabat. The sight of women playing the rough sport in the conservative Muslim society has sparked interest from Moroccan media and across social networks. But Zahraoui says she has not once encountered a “problem of a sexist nature” since launching the project. Female Moroccan athletes are nothing new, she says — they “have distinguished themselves in sports since the 1980s”. “What we need are teams, a federation, coaches, referees, trainers and a championship,” she insists. For now, the Pirates prefer to play flag football, a watered-down, low-contact version of the sport that requires little equipment. The lighter touch has helped draw in participants from other sports such as basketball and judo who otherwise may not have joined. “I came to watch a friend train, but the coach convinced me to come and try,” says Ghita Ouassil. The chance encounter last year has turned the 21-year-old English literature student into a football regular.